Photograph of the promenade at Makarpura, Gujarat from the Curzon Collection, taken by an unknown photographer during the 1890s. The view is of the formal gardens in the grounds of Makarpura Palace, the country residence of the Gaekwad Maharajas. 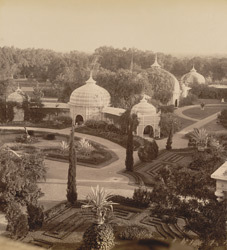 The palace was built by Sayaji Rao III (ruled 1875-1939) in the late 19th century and the gardens were designed and laid out in the English style by a landscape architect and gardener from the Royal Botanic Gardens at Kew. The garden contained fountains, grottoes, and pergolas, here designed in the shape a trellis-work summerhouse inspired by Victorian glass conservatories.